The stretch of coast between the mouth of River Doon (NS 24 195) and Greenan Castle (NS 12 193) is a well-known local birdwatching site. Over 190 species have been seen here, including several unusual migrants. The main habitats of the area are the mudflats, rocks and mussel beds exposed at low tide, which are backed by dune grassland. There is also a section of low cliff and scrub around Greenan Castle. Woodland is scarce but there is a small wooded island near the mouth of the River Doon. North of the river lies Cunning Park, an area of marsh and fields, almost surrounded by houses. Car park off Castle Walk is un-surfaced, park in road. Easy access to cycle track. National Cycle Route 7 runs along the shore. Good viewing from cycle bridge over the River Doon. Being a coastal location, the main species of interest are waders, wildfowl and gulls. A total of 2 species of wader have been seen and are present in numbers from late July to April/May. In autumn, a night-time roost of Curlew can number over 1000: these birds can often be seen on the rocks at Greenan Castle in late evening. Similarly high numbers of Lapwing and Golden Plover also occur in autumn and winter. Many of these birds move onto Ireland in the winter. Other waders obvious on the shore are Oystercatcher , Ringed Plover , Redshank , Dunlin and Turnstone . In autumn a closer look may reveal Sanderling , Little Stint and Curlew Sandpiper , whilst in the winter, Greenshank are regular. These species are best looked for at high tide when the birds gather to roost at the Doon mouth and the shore below the Greenan car-park (NS 15 193). Wildfowl are mainly present in the winter, with the nationally important Goldeneye flock, numbering several hundred birds, the main interest. Also present are flocks of Mallard , Teal and Mute Swans . Many other species pass through on migration including Wigeon , Pintail and Common Scoter . In autumn, flocks of geese and swans can be seen passing overhead in varying numbers. A small flock of Scaup is regular in winter, and during cold weather, large numbers of Pochard and Tufted Duck can occur. During the summer, flocks of up to 400 Eider gather to moult in Ayr Bay. Small numbers of divers and grebes are often present in Ayr Bay and are most numerous from February to April. The most commonly seen are Red-throated and Black-throated Divers and Great Crested Grebes . 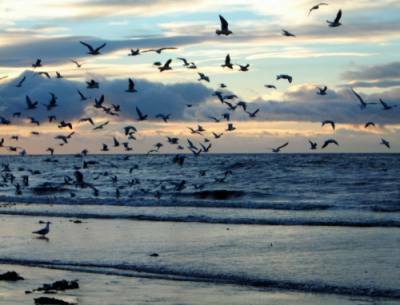 Doonfoot is well known for its gulls, with a very large roost of up to 0,000 birds present in autumn and winter. Amongst these large numbers, Glaucous and Iceland Gulls from the Arctic are regular in winter, whilst Little , Mediterranean and Ring-billed Gulls occur occasionally. Although the shore can be quiet in spring and summer, look for terns, Gannets and Manx Shearwaters feeding out in Ayr Bay. Also at this time of year, the grassland, scrub and woodland are at their best for breeding birds. Watch and listen for Chiffchaff and Blackcap in the woodland, and Whitethroat , Sedge Warbler , Grasshopper Warbler and Stonechat in the grassland and scrub. The locally rare Lesser Whitethroat can sometimes be found in the scrub at Greenan Castle. The Doon mouth is also a good spot for Kingfisher , which are best looked for from the Scaur O’ Doon car park. Park around Cunning Park Drive, Gearholm Road which are off Doonfoot Rd and make way down to the sea front. Turn right walking towards Ayr and commence birdwatching! Walk along till you come to the car park at the Ayr India restaurant and turn right up Seafield Road. Continue till the traffic lights at Racecourse Rd. Turn right again and cross road into playing fields/running track and walk along perimeter which leads onto Seafield golf course. Continue around edge of golf course (keeping all dogs under control so they don’t upset the golfers!) until you come to gap in wall ahead of you. Go through and ahead till you come to the footpath across the golf course. Turn right and then left just before the gate onto Doonfoot Rd. This path may be marked with a Tam O’Shanter trail sign! Continue along path in amongst trees and bushes. Cross driveway up to Belleisle House onto path at other side. Pass through tall trees where there is a Rookery turning right at corner of deer/pony field. This paved path takes you onto Greenfield Ave (look in trees to your left down side of golf course and Greenfield Ave – saw a Woodpecker there once!). Turn right onto Greenfield Ave and cross road at bottom to the Doonfoot Store. Head for the sea following the river to see if you can spot the Kingfisher , or in my case, the Heron and then make your way back to the car. This walk takes about an hour or just over (more if you birdwatch diligently!). This description has been published in the leaflet Birdwatching around South Ayrshire produced by South Ayrshire Council, and has been reproduced with their kind permission.